I’m in Oxford for the Skoll World Forum on social entrepreneurship, and this afternoon I took part in an event called Oxford Jam, where I carried on a discussion with Michael Szymanski (MEST Ghana) and Corina Gardner (GSMA) focused on “investing in tech in Africa”. It was a good session, as it was very much a discussion between the audience and ourselves. There are a number of tech hubs and labs coming up across the continent, and each have a different focus as we all try to experiment in our space to see what works. Michael works at MEST in Ghana, which is a very focused 2 year program on training entrepreneurs, where they then invest in some of the ideas that come out. This varies greatly from the iHub model where we’re primarily trying to connect people rather than train them, which is also different from what ActivSpaces in Cameroon or ccHub in Nigeria are doing. We’ve seen that the biggest gap in funding comes at the early, risky stage. How can we get more local angels involved in tech startups in Africa? New seed funds are starting up in some of these spaces, and it’ll be good to see how that continues to grow and if we can create a true base, a true foundation, to the startup ecosystem in the African technology hub cities. We’ve heard some grumbling about the social impact investment circle, that it takes a lot more effort and has a lot less return going after the money in these circles than it does just going after more traditional VCs or other investment vehicles. At the end of the day, what’s needed is to build a business, something that is sustainable and can generate revenues. That takes time, connections and capital to make happen, and the question is whether the social impact investors can keep up with the normal investors in Africa. When an investor comes into a new country it’s difficult for them to get plugged in, and hard for them to know who to trust. They need trusted intermediaries to do the initial introductions, and then a way to figure out if the companies that they’re potentially investing in are legit. This can come at a higher cost than where the investor is coming from, as the legal and business structures can differ quite a bit. From the outside, it also looks like most people invest in people that look like them, which would explain why more of the social impact investment money being directed at Africa seems to go to people who come from Europe or the US. I’d like to see more of the social entrepreneur programs (schools like MIT and Stanford, as well as the big Fellows programs) doing more work getting out into the Asia and Africa. It seems to me that there are just as many people who come from these countries who know the real problems, and the cultural issues there, that could use some time overseas in the US/Europe, not just the other way around. The event really starts now, where my colleague Patrick Meier at Ushahidi will be taking the stage for the opening plenary session with Judith Rodin CEO of Rockefeller Foundation, Roger Martin, Dean, Rotman School of Business, University of Toronto and Soraya Salti, Senior Vice President of Middle East/North Africa for Junior Achievement Worldwide, INJAZ Al-Arab. 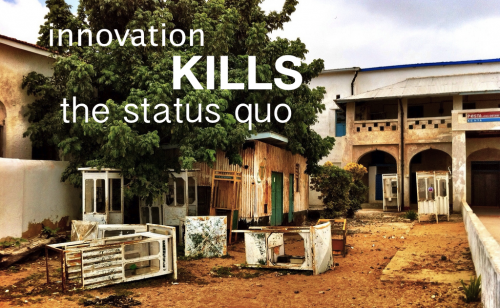 This is from a blog post that I wrote for the Skoll World Forum, coming up in a couple weeks, that I titled, “Innovation Comes from the Edges“. I was recently asked, “how do you find innovators?” It’s an odd question really, one that I hadn’t thought about before, but one that is valuable to think through. You have to dig deeper and think why innovations happen at all, and what the power structures are that make them be identified as innovative. After all, innovation is just a new way of doing things than what is currently the norm. In any industry, society or business there are status quo powers at play. These are generally legacy structures, setup for a time and place that needed that design. Think big media in broadcasting and print, how has it been disrupted by the internet, mobiles and social media in the last 10 years? How about government? How about the humanitarian space? How about the energy industry? All of these industries were seen as “innovative” when they came into their own, decades and centuries ago. Now they are legacy in both infrastructure and design, and their relevancy in their current state is in question. By their nature they fight to maintain the power structures that keep them in the position that they hold. Changes to the foundations on which they stand is not only scary, it’s deadly. Innovation comes from the edges, so it comes as no surprise that innovators are found in the margins. They are the misfits among us, the ones who see and do things differently. They challenge the status quo and the power sources that prop that up, so are generally marginalized as a reflexive and defensive action. Think about what you’re really asking for when you say you want innovation in your space. Because, when you do, you’re asking for the outliers, the disruptors and the rebels to have their way. You’re asking for a new way of thinking and doing – and if you’re in a position of power within an industry, you’re likely going to be upset along the way. I’ve seen my fair share of “social entrepreneurs” as a TED Senior Fellow and a PopTech Faculty Fellow, at the iHub – and of course as a co-founder of Ushahidi I’ve been labeled as one as well. I’m still not sure that I buy into this term (but that’s a longer discussion for another time). All successful social entrepreneurs are innovators, though all innovators aren’t social entrepreneurs. This space is being defined as one where the innovation has to be something that empowers the disempowered, strengthens the weak, or enriches the lives of the poor. These are loose boundaries, but ones that allow the subjectivity of founders and funders to define their work. Since it’s fairly new, this works for everyone quite well. At the end of the day what I do, and what the other social entrepreneurs that I’ve gotten to know over the years do, is disrupt something. Simply put, we’re working from the outside, or the edges of an industry, with less money and less buy in, trying to change the way that it works. Sometimes undermining it entirely, sometimes coming up with new markets and new industries, all in our search for a better way. Many of the people who say they want change, and aren’t happy with the current solutions found in the world, aren’t actually serious about wanting that change. It’s lip service. There are very few funders and forums for game changers to be heard and for them to find funding to take their idea, product or service to market. The same people who say that they don’t want the same traditional approach, apply traditional ways of thinking to finding and funding innovators. There is precious little innovation in the funding space, even as these same funders look to find the next organization that will turn the world on its head. In a space overflowing with grand claims of disruption, which funders are actually that themselves? How many “social impact” funders actually fund anything? In the social entrepreneurs world, it’s a lot less painful to get funding from traditional VCs and angels than it is this new social impact investor type. I can think of a few funding organizations that actually try new things, and can count them on one hand: Skoll, Omidyar Network, Knight, Indigo Trust. I’ve probably missed a couple, but you get the drift, this isn’t an area where people are changing with the times. Last year, after Pop!Tech where I was labeled a Social Entrepreneur Fellow, I wrote a post for them asking, “if every African entrepreneur is a social entrepreneur?” This questions stems from my lack of clarity on what defines a “social entrepreneur” in the first place. I just pulled into San Francisco for the second annual Social Capital Markets conference (SoCap). Kevin Jones, the convener of the conference calls this, “The market at the intersection of money and meeting.” So here, Social Capital is supposedly about putting money behind social entrepreneurs. Rob Salkowitz says, “Every entrepreneur who creates employment & opportunity where it’s needed is a social entrepreneur.” That’s broad, but so is the terminology we’re starting with.